A hearty and savory vegetarian dish made for sharing with loved-ones. For the Veggies- In a small bowl combine olive oil & garlic-set aside. Preheat girl to med/high. Cut veggies into 3/4-1 inch pieces & brush each side with garlic olive oil. Grill crookneck, zucchini and eggplant for 5-10 mins per side or to preferred doneness. Grill onions 2-3 mins per side. Set aside. For the Balsamic Reduction- Combine vinegar & sugar in a small sauce pan & bring to a simmer over medium heat, whisking every so often. Once simmering lower temperature to a low heat and cook until reduced by half, about 20 mins. Balsamic should flow off of spoon in a steady stream similar to syrup. For the Polenta- In a large sauce pan bring broth, water & salt to a boil. Lower heat to a simmer and gradually add in polenta, stirring frequently to prevent sticking. Cook polenta for approximately 30 mins or until mixture is very thick. At the 20 min marker add in rosemary, parmesan and olive oil, continue stirring frequently. Serve warm with veggies or place in a baking pan lined parchment paper. Let rest in refrigerator for at least 30 mins. Cut into squares or preferred shapes. Brush with remaining garlic olive oil and grill 3-4 mins per side (wipe down grill with a little extra oil to prevent sticking of polenta). Serve veggies over top of polenta. Garnish with goat cheese crumbles, walnuts and drizzled balsamic reduction. 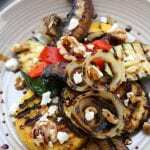 Cooking times will be half if grilling vegetables & cooking polenta is done at the same time.